Oil refineries and chemical plants across the Texas Gulf Coast released more than 1 million pounds of dangerous air pollutants in the week after Harvey struck, according to public regulatory filings aggregated by the Center for Biological Diversity. While attention has zeroed in on the crisis at the Arkema chemical plant in Crosby, other facilities — oil refineries, chemical plants and shale drilling sites — have been reporting flaring, leaks and chemical discharges triggered by Harvey. Emissions have already exceeded permitted levels, after floating rooftops sank on oil storage tanks, chemical storage tanks overflowed with rainwater, and broken valves and shutdown procedures triggered flaring at refineries. The chemicals released in the week after Harvey made landfall, including benzene, 1,3-butadiene, hexane, hydrogen sulfide, sulfur dioxide, toluene and xylene. All seven chemicals are toxic air pollutants documented to harm human health; several cause cancer. Other emissions would bring the total to more than 5 million pounds, the Center for Biological Diversity said. “Our general concern is the fact that these are relatively unseen environmental threats that don’t normally get recognized,” said Elena Craft, a toxicologist at the Environmental Defense Fund. Further damage and emissions across the region could be uncovered in the coming weeks as floodwaters recede, and chemical safety experts warned that restarting plants could carry as many dangers as the shutdowns. “We are not out of the woods yet, not the entire industry,” said M. Sam Mannan, a professor of chemical engineering at Texas A&M University and director of an institute that studies safety procedures in chemical factories. In addition, winding rivers overflowed and washed over some of the waste pits and drilling pads at shale gas and shale oil drilling sites in the Eagle Ford play in Central Texas, according to satellite imagery collected by Sky Truth, a nonprofit group that monitors the environment. The extent of the damage was not clear. “It’s unsafe and unacceptable for the petroleum industry to be releasing these massive quantities of air pollutants when storms hit,” said Shaye Wolf, climate science director of the Center for Biological Diversity. She added that the companies could do more to limit flaring and leaks. “That shouldn’t be common industry practice,” she said. Companies have two weeks to submit filings to the Texas Commission on Environmental Quality so those figures could increase substantially. But the filings so far give a good picture of some of the problems. The most common problem in oil refineries has been floating rooftops on storage tanks. Because petroleum is flammable, open space in a tank would collect dangerous vapors. So the oil industry storage tanks have round lid-like rooftops that rise and fall with the level of liquid in the tanks. With heavy rains, many were damaged and sank from the weight, leaving crude oil or petroleum products in the open air emitting fumes. In some cases, they have caused spills too. Rooftops sank at four tanks at the Pasadena products terminal of Phillips 66. Three sank at the Pasadena terminal of Kinder Morgan, a pipeline company. Two were damaged at Shell’s Deer Park refinery. One each sank at Valero Energy Partners’ Houston terminal, Marathon’s Texas City plant and ExxonMobil’s Baytown refinery. Flooding has posed other challenges. For a week, BASF, the second largest producer of chemical products in North America, has been struggling to contain rainfall at its Beaumont Agro plant, according to BASF’s filings with the Texas Commission on Environmental Quality. The plant produces pesticides, herbicides and insecticides. The company started trucking waste water off the site the week before landfall in an attempt to maximize water storage capacity. Then, unable to contain contaminated storm water and process waste water, the company shut down operations on Aug. 27 and brought in temporary water storage capacity. 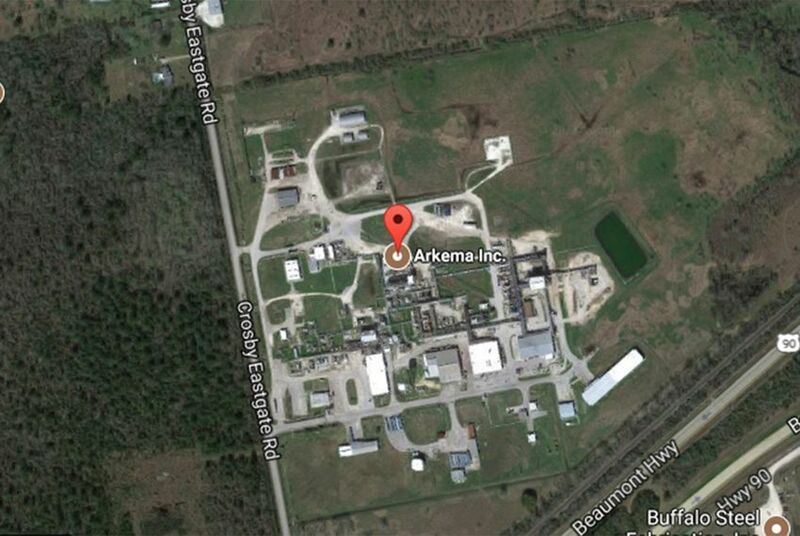 Nonetheless, the tanks overflowed, spilling chemicals into a diked containment area. The containment area then overflowed to the surrounding ground. Roberto Nelson, BASF’s senior manager for community relations, said a test of leaking waste water on Aug. 29 “indicated there were trace amounts of nonhazardous process chemicals in the discharge water.” He added that the overflow stopped on Aug. 31. At ExxonMobil’s Beaumont oil refinery, oil flowed over a 10-foot levee and spilled onto a nearby county road, due to the rising Neches River, an ExxonMobil spokeswoman told the local newspaper, the Beaumont Enterprise. A different spokeswoman, Suann Guthrie said the company was “closely monitoring” and “taking steps” to contain two sheens. Oil and chemical companies have also been flaring large amounts of gases, beyond levels ordinarily permitted by the Environmental Protection Agency or TCEQ. On Sept. 2, the TPC Group said in a TCEQ filing that it was working to control the source of gases being flared at its Port Neches facility. It has already emitted an estimated 1,000 pounds of carbon monoxide and 1,000 pounds of nitrogen oxides, well beyond the state’s permitted levels. Nitrogen dioxide is an air pollutant by itself and reacts in the atmosphere to form ozone. It also contributes to breathing problems and acid rain. Huntsman Petrochemical on Sept. 2 reported it had flared an estimated 1,000 pounds of methyl tert-butyl ether, used as an oxygenate in gasoline and regulated in California. The flaring exceeded the Texas limit of 0.04 pounds an hour for the plant. Total said in a filing Friday that its petrochemical refinery in Port Arthur had no power and over a 48-hour period had flared half a dozen chemicals, emitting sulfur dioxide in one flare that was 50 times greater than the regulatory limit. Texas is the nation’s largest producer of chemicals, with $129 billion in shipments and 79,000 employees, according to Dooley’s group. The Environmental Protection Agency on Saturday reassured residents about health concerns. Yet the city of Houston registered up to 15,000 parts per billion of smog-forming volatile organic compounds in and around the Valero refinery in east Houston’s Manchester neighborhood, as well as at other refineries in the region. These concentrations are at least 10 times higher than health officials deem safe, the nonprofit group EDF said in a statement. The EDF’s Craft said “EPA said inaccurately and inappropriately that residents should not be concerned about the air quality around Houston.” The Houston area was under alert for ground-level ozone, a lung-damaging air pollutant, for the fourth day in a row, according to the EPA’s Air Now Web site. Mannan, the chemical engineer at Texas A&M, last year wrote a study ranking Houston-area facilities by their potential to cause harm to the public during a disaster. He said restarting production at dozens of waterlogged plants poses enormous risks for workers and the public. “Additional events could happen because, if you think about it, a lot of these tanks got submerged in water and a tremendous amount of force is created in 40 feet of water. It can move the tanks around or deform them,” he said. The Chemical Safety and Hazard Investigation Board on Friday issued a “safety alert” urging oil and chemical facilities to take special precautions when restarting after Harvey. “Restarting a refinery poses a significant safety risk,” said CSB chair Vanessa Allen Sutherland. Aaron C. Davis contributed to this article. Disclosure: The Environmental Defense Fund, Texas A&M University and ExxonMobil have been financial supporters of The Texas Tribune. A complete list of Tribune Donors and sponsors is available here.